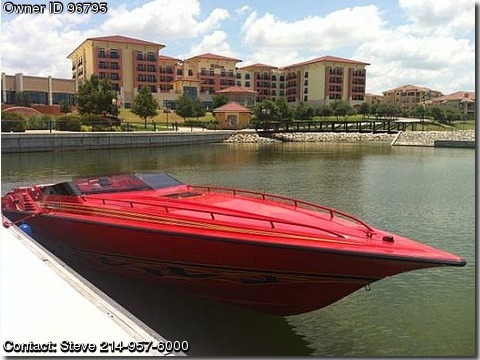 Please contact the owner directly @ 214-957-6000 or xxtremeroofn(at)aol(dot)com.35 Fountain 525Supercharged Factory Mercrusier engines with less than 100 hours since complete re rig of entire boat in 2008 Shows like new ! This boat has been meticulously maintained and needs nothing ! Hydraulic steering , 3 sets of props , porta pottie , 2 sinks , built in cooler , trailer has new paint , brakes , carpet wood etc , Boat has new Marine Alpine system that rocks the house ,3 new Gel cell batteries , Garmin Satellite tracking system , all new Gauges and cluster , fresh buff on complete boat , new canvas morring cover , cockpit and full cover . Fresh mobil one synthetic oil and outdrive , new impellers , new engine couplers , Haylon Fire system , everything works as it should , no signs of wear in interior looks like new , this boat has been my baby for 7 yrs and prior to that nascar mechanic owned it and was just as meticulios as i about cleaning and polishing im sure i missed alot , comes with all anchors life jackets flair gun etc. would entertain trade for Hotrods Zo6 also will entertain all resonable offers .. Call for more details Two 14 -9 five 7 -6000.